Success! 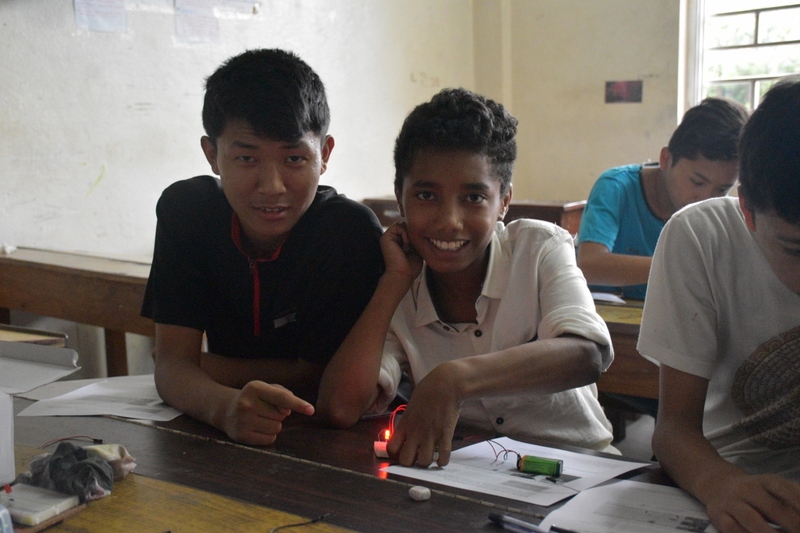 Students discover how to light up two LEDs. 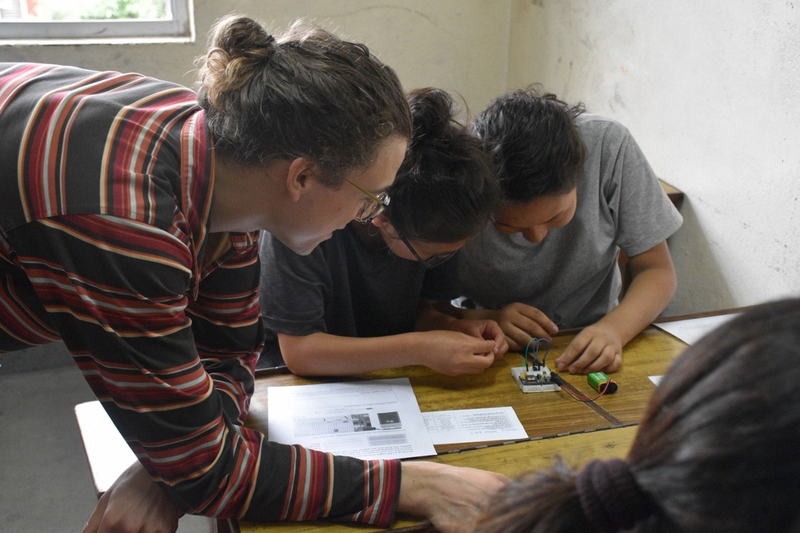 A hands on introduction to electricity and circuit building. 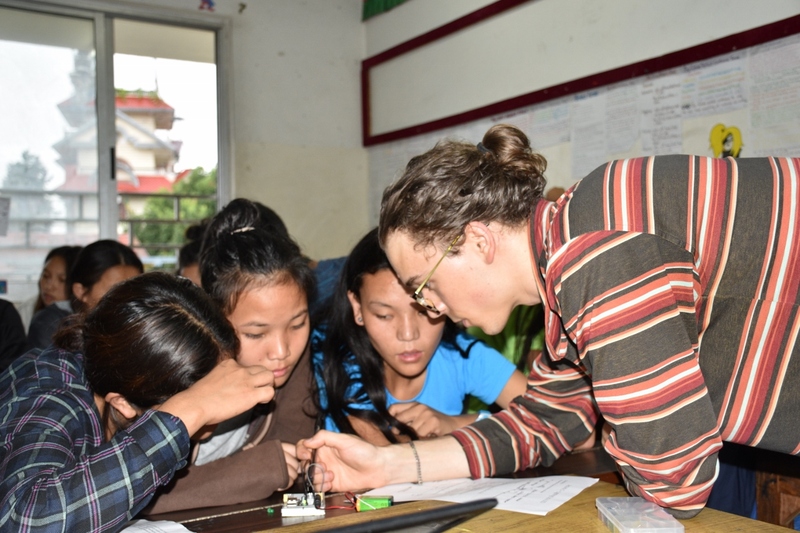 On Saturday August 12th, Tashi Choeden (B716) and I ran our first electronics activity with the kids at Shree Mangal Dvip School (SMD). 88 students registered to participate in the activity during their free time, 40 boys and 48 girls 1 from Grades 4 to 9. We ran four one-hour sessions with the groups divided according to grade. In the end, 75 students attended out of SMD’s 349 boarding students. We were surprised and heartened by the amount of interest shown. The total cost per student is $7.75 CAD, using one set of parts per student. Only $0.20 of the materials are likely to be consumed during the activity, so the initial investment can be used by a much larger number of students. We used 10 sets with 75 students working in groups of 2 or 3 depending on the size of the session (15-25). With these numbers, the cost was $1.03 CAD per student with a total of less than $0.50 CAD worth of parts broken (burnt out LEDs). By Kathmandu standards, the material cost per student was about the cost of one meal. Please see the lesson plan for a full cost-breakdown and purchasing details. We learned a lot during the four sessions and made updates to the activity accordingly. We found it helpful to give the handouts after the explanation was finished, so the students weren’t distracted by it. We also recommend encouraging the students to ask at their peers for help before asking one of the instructors. 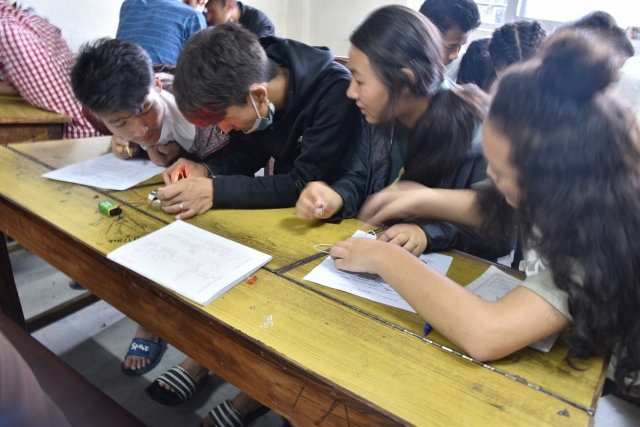 We noticed that the students had a hard time understanding how electrical connections are made on the breadboard, so an additional note has been added to the handout. 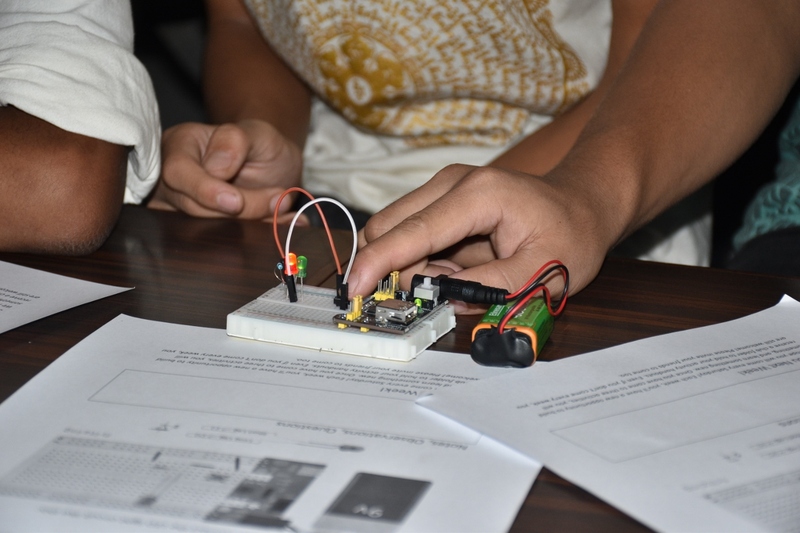 Comprehension questions relating to the breadboard have been added to the lesson plan to check the students’ understanding. Can you get two LEDs to light up? What happens to the brightness of the LEDs? Can you draw the 2nd LED into the circuit diagram? Try using two buttons in the circuit. Can you setup the circuit so that both buttons must be pressed to turn on the light? How about pressing either button to turn on the light? Draw the 2nd button into the circuit diagram. Special thanks to Grade 7 student Tamdin Tsering (B703a) for his help on Saturday! 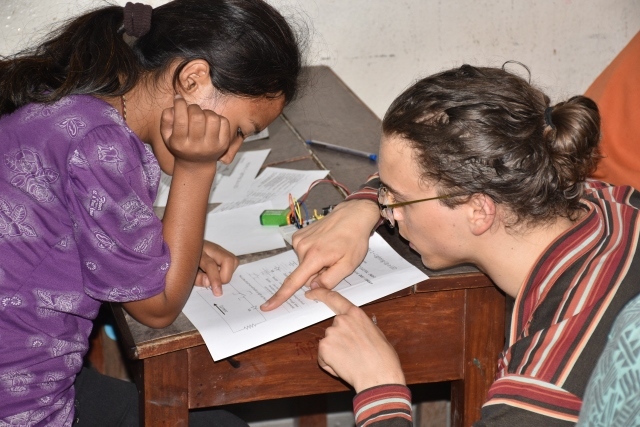 He joined Tashi and I in helping the students during all four sessions. We look forward to his continued involvement as a student-mentor.